Tangent graph is not like a sine and cosine curve. This graph looks like discontinue curve because for certain values tangent is not defined. For some values of x, cos x has value 0. For example, x = π/2 and x = 3π/2. When this happens, we have 0 in the denominator of the fraction and this means it is undefined. So there will be a "gap" in the function at that point. This gap is called a discontinuity. we know that tan x is a periodic function with period π This means it repeats itself after each π as we go left to right on the graph. 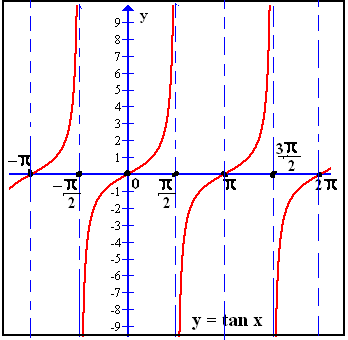 As x increases from 0 to π/ 2, tan x keeps on increasing from 0 to ∞. 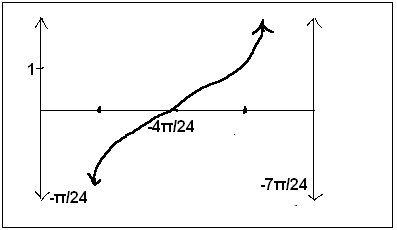 As x crosses the value π / 2, tan x becomes negative and is arbitrarily large in magnitude. It increases to 0 as x increases from π / 2 to π. 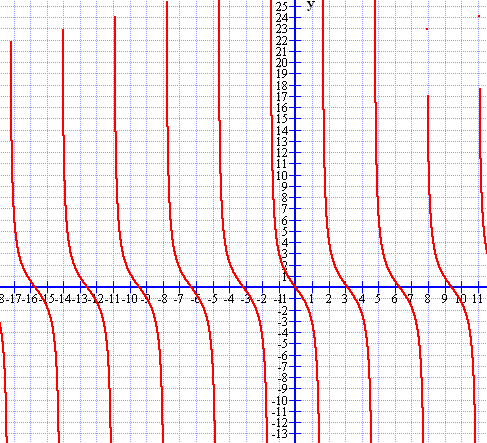 Note that there are vertical asymptotes (the blue dotted lines) where the denominator of tan x has value zero. 1) Draw the graph of y = tan 2x. 2) From the given graph write the function of it.